Handling Tips: 45-55°F. Keep cool and dry. 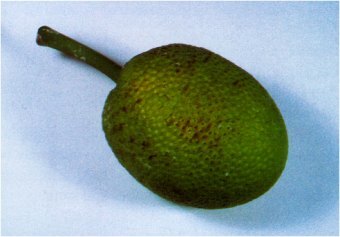 General Information: Breadfruit can be used at various stages of ripeness depending upon what flavor you wish. Green (unripe) breadfruit is hard and rather dry, also quite starchy. As it ripens, it becomes naturally more fruity and sweeter. Commonly used as we North Americans use potatoes, you may boil, bake, fry, mash or cream. High in vitamin C and potassium.